Perpetua is a clever little puzzle game where you use node based coding to program a little robot to carry out a variety of tasks. In each level of Perpetua you are tasked with making a robot carry out a variety of tasks – from simply moving forward six squares to sorting and moving boxes. You don’t have direct control of the robot itself – instead you program it then watch as it carries out its functions. Programming the robot in Perpetua is fairly simple – you just drag and drop the various nodes then link them up to form a functional program. Each level introduces a new type of node (or multiple nodes) and you slowly learn how to program the robot to perform more complex tasks as you play. It’s a fun game that takes the relatively complex task of programming robotics and makes it easy to follow, while still offering a nice amount of challenge in its puzzle design. 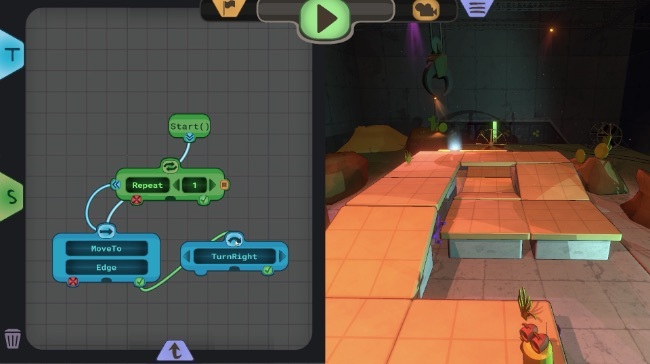 A clever little puzzler where you learn the basics of node-based coding as you play. Note: Be sure to pay attention to how the Repeat Node is hooked up – it can be a little tricky to figure out.